Uplifting achievements in the Gazette on 16 February 1968! 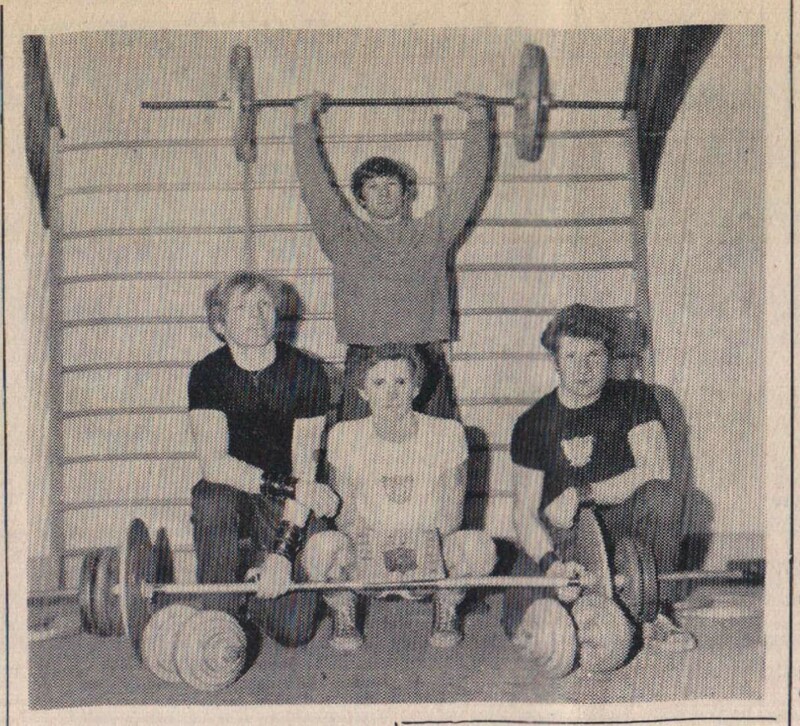 This picture shows Arthur Fisher (back) from Appledore Youth Sports Club, and Leonard Found, Philip Piper and Vernon Keens from Bideford Physical Culture Club who were taking part in the Devon and Somerset National Association of Boys’ Club weight-lifting championships at Taunton. George Powe was best man at his twin brother’s wedding in 1968 and the bride’s cousins Cynthia and Daphne Lamey were bridesmaids. 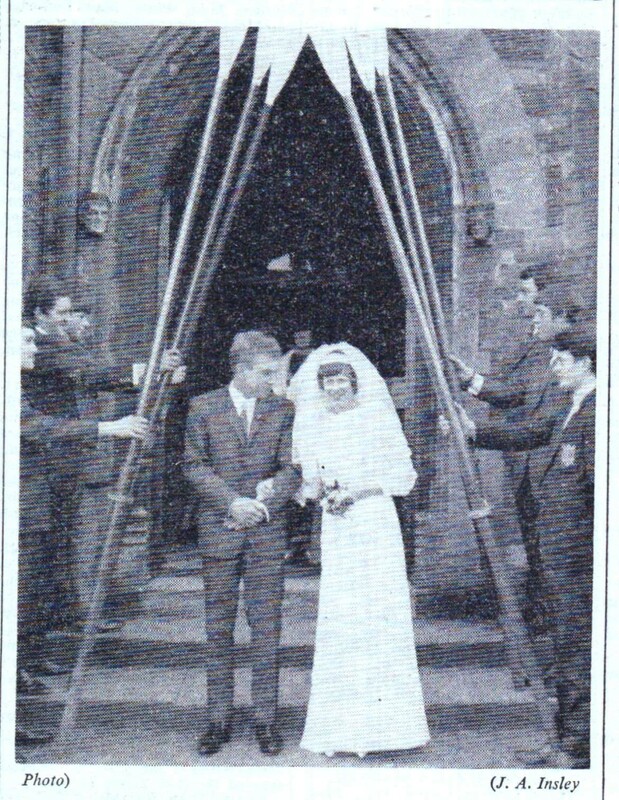 John Powe of Appledore and Maureen Hosegood, from Bideford, were married by Reverend T Derwent Davies in St Mary’s Church, Bideford. Fellow rowers from Bideford Amateur Athletic Club formed a guard of honour for the bride and groom who had their reception at the Moose Hall, Bideford, and then travelled to Wales for a honeymoon. This year's individual champion of the Appledore Darts League is Appledore A.F.C.s leading goal-scorer, Bobbie Bailey. In the final held at the Appledore Hall on Friday evening, he defeated last year's winner, Herbie Smale, by the odd leg of three. Bailey won his place in the final by defeating his team-mate, Briian Jenkins, by two games to one. In the other semi-final Smale knocked out E. Kitto by the same margin. Appledore is to have a Barnstaple girl - 18 years old Syliva Passmore - as Regatta Queen this year. Sylvia, who is a clerk in a Barnstaple caol merchant's office, is one of twin daughters of Mr. and Mrs. Passmore. 83, Pottington Road, Barnstaple. 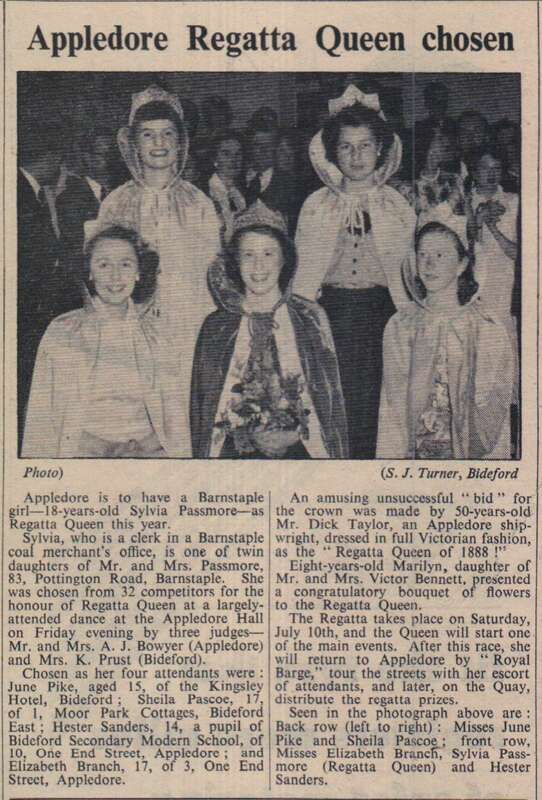 She was chosen from 32 competitors for the honour of Regatta Queen at a largely attended dance at the Appledore Hall on Friday evening by three judges - Mr and Mrs A J Bowyer (Appledore) and Mrs K Prust (Bideford).